Cook the rice in four cups of boiling salted water with green cardamoms, black cardamom, cloves, cinnamon and bay leaf, until three-fourth done. Drain and set aside. Mix together the carrot, French beans, cauliflower and salt and boil in three cups water till three-fourth done. Add the peas and cook for a couple of minutes. Drain and refresh under cold running water. Set aside. Heat two tablespoons of oil in a non stick pan and add the caraway seeds. When they begin to change colour, add the onion and sauté until golden brown. Add the green chillies, ginger paste and garlic paste and stir. Add a little water so that the mixture does not burn. Add the turmeric powder, coriander powder, red chilli powder and mix well. Add the tomatoes and cook they are soft. Add half the yogurt and salt and mix well. Add the boiled vegetables and mix well. Mix the saffron in kewra water. 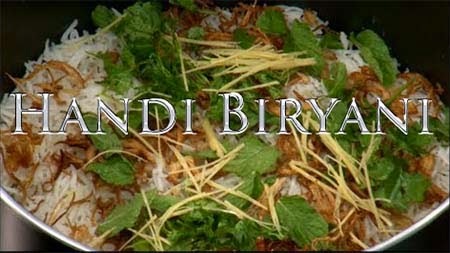 In a handi, arrange a layer of the vegetables and top it with a layer of rice. Sprinkle fried onions and a little salt. Sprinkle torn mint leaves, torn coriander leaves, ginger strips, a little saffron-kewra water and ghee. Spread another layer of vegetables, rice, fried onions, torn mint, torn coriander, ginger strips, saffron-kewra water and ghee. Sprinkle garam masala powder and the remaining yogurt. Cover and place over a hot tawa. Cook for fifteen to twenty minutes. Serve hot with a raita. Cut chicken in one inch pieces. Boil rice and set aside. Heat oil, add cinnamon, bay leaves, cloves, cumin seeds, green cardamoms and sauté for half a minute. Add sliced onions and sauté. Add slit green chillies and chicken cubes and continue to sauté. Add turmeric powder and mix Add tomatoes and salt and mix. Add ginger-garlic paste, red chilli powder and yogurt. Mix well. Add half the fried brown onions. Add the boiled rice on top. Sprinkle garam masala powder, ginger strips, mint leaves and coriander leaves. Sprinkle milk, rose water and remaining browned onions. Cover and cook on low heat for about ten minutes. Garnish with the egg slices and serve hot.